Hardwood flooring enhances the appearance of any room in your home, but these rugged surfaces represent a big investment. Like any investment, you want to be sure that you get the highest returns possible. When it comes to flooring, proper cleaning of hardwood determines your ability to enjoy their beauty for many years without worrying about damage or repairs. Here at Classic Floor Designs, we recommend a regular cleaning regimen to maintain the original appearance of your hardwood floors. There’s a lot of conflicting information out there about what products to use, what methods to avoid and how often to clean. We hope that these tips will help clear up any confusion and guide you in preserving the floors you love. There are two types of wood flooring: solid and engineered. Both offer the beautiful appearance that makes hardwood so attractive, but the materials differ slightly when it comes to routine cleaning and long-term care. Solid floors are made from single pieces of hardwood that are generally about three-quarters of an inch thick. Most come finished with a protective coating that creates a reflective “high gloss” look. Solid wood is available in many common and exotic varieties that can be sanded and refinished up to ten times over the life of the floor. Engineered flooring is pieced together from three to five layers of high- or medium-density fiberboard with a thin hardwood veneer on top. Because of the minimal amount of hardwood used, these floors can only undergo one to two rounds of refinishing. However, they tend to be more durable than solid floors when it comes to handling high foot traffic and varying levels of humidity. Preventative maintenance cuts down on the amount of dirt and grime that comes in contact with your floors. Place a heavy-duty mat outside your front door for people to wipe their shoes on, and position another mat just inside the threshold. Have visitors and family members remove their shoes before stepping inside. Use a boot or shoe tray to keep footwear organized and away from the wood surface. Area rugs are perfect for high-traffic spots or rooms where kids spend a lot of time. Rugs keep messes off the floor and are generally easier to clean than the wood itself. Use rugs with backings to reduce the risk of slipping, but make sure that the backing material is something that won’t damage the floor. Quick cleaning on a daily, bi-weekly or weekly basis can be done using a soft-bristled broom and a dustpan. This removes superficial dirt before it becomes ingrained in the floor surface. Small brooms and handheld vacuums are useful for cleaning in corners. To get rid of even more dust and debris, try a sweeper that uses electrostatic dust cloths. Pay special attention to areas where dirt is most likely to build up, such as the kitchen, the front hallway and the bathroom. Opinions differ on how often you should vacuum hardwood floors. For high-traffic areas, daily vacuuming may be necessary to remove deeper dirt. In other rooms, bi-weekly or weekly vacuuming should suffice. One thing that everyone agrees on is to never use a beater bar. The harsh bristles can damage the finish and leave it looking dull. Instead, use the hardwood floor setting or a floor brush attachment to lift away dirt. Electric brooms are also gentle enough to use for frequent cleaning. Don’t be tempted by the “deeper clean” that floor buffers claim to offer. The abrasive pads can ruin the surface of the wood. Even with preventative maintenance and routine cleaning, wood flooring still winds up with grime, oil and stubborn dirt on its surface. That’s why it’s important to clean the floor more aggressively once or twice a year. However, you have to use the correct kind of cleaning products and tools. Your goal should be to leave no standing water at all and avoid harsh substances that can scratch or dull the finish. The best cleaning solutions are mild and include mixtures of dish soap and water; a solution of water, olive oil and lemon juice; hot water and borax; and lukewarm black tea. Apply your chosen cleaner using a damp mop by dipping the mop into the solution and wringing it out until it’s almost dry. Finish off by buffing the floor with a towel. Alternatively, you can place the cleaner in a spray bottle and mist the floor as you go. All of these can cause damage or result in slick floors that pose a hazard to you and your family. Diligence in regular cleaning will prevent the most serious messes, but it’s impossible to completely avoid scuffs, marks and spots. If you discover any blemishes on your wood floor, sprinkle the area with baking soda and clean it with a damp sponge. The dirt should lift right off. Drips, spills, sticky streaks and food that can dry onto the floor should be cleaned up immediately. If you miss something and find an unidentifiable substance stuck to the wood, use a cleaner formulated to remove tough dirt and wipe with a gentle cloth. Deep stains and spots may require sanding and refinishing to remove. Following these tips may seem like a lot of work, but it’s worth the effort when it comes to maintaining your hardwood floors. As you begin to incorporate each step into your regular cleaning regimen, you’ll see the true beauty of the wood begin to shine through. All it takes to continue enjoying that beauty is to devote a little extra time each day to proper floor care. In our opinion, it’s time well spent. Unless you’re going with a completely eclectic design, decorating your interior living space is all about adhering to a theme (and indeed, eclectic designs can be considered a theme in of themselves). Many times, a theme has a lot to do with color: the floors, the paintings, the furniture, and so on. 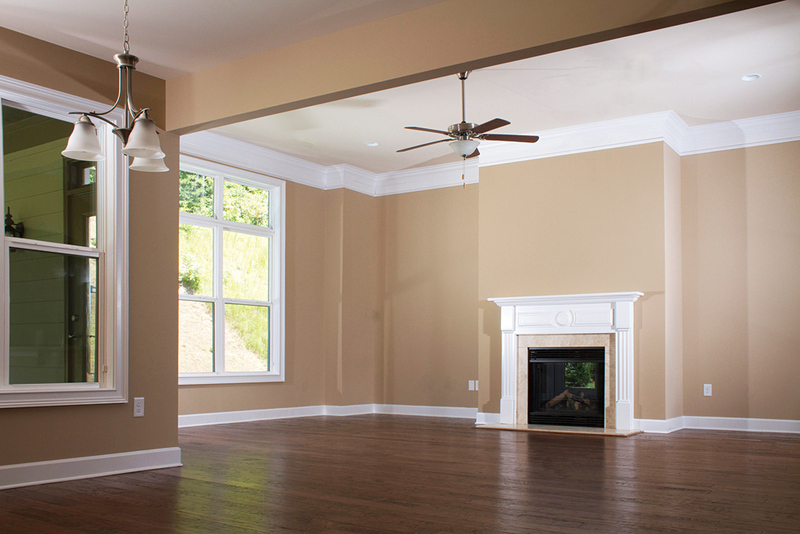 So with that in mind, what are the best color options to match your hardwood flooring with your walls? In this article, we will talk about the easiest and best ways to make your living space really mesh between the walls and floors. The great thing about wood, other than its elegance and its ease of maintenance, is that there is a wide abundance of colors to choose from. There is no such thing as a “standard” color of wood floor: you can pick from a wide variety of tree species, undertones, and stains. Indeed, there are so many options that it can even be overwhelming when trying to match a floor to a wall, but that’s what we’re here for! The simplest thing you can do to coordinate color between the floor and wall is to pick a neutral tone of paint for the walls. Virtually any color of wood pairs nicely with a neutral wall (white is a very popular option). Even mixed wood floors will do well when put against a neutral background, allowing you a bit of creative freedom when it comes to installation. If you’re worried about the space not having enough personality, throw in some colorful furniture and/or rugs to make it vibrant. For some people, however, neutral colors are boring. So many people have white or similarly-colored walls, so perhaps you want to break the mold and do something off-kilter. Perhaps you should consider choosing a wall shade comparable to your floorboards. If your wood has golden or reddish undertones going for it, paint your walls a warm color as a complement. Orange flooring pairs nicely with rust-colored or terracotta walls, and rich, red woods look gorgeous next to a wine or burgundy paint. Pair gray or ashen woods with cool colors like blue or green. Now, what if you want to take it one step farther and go for an off-the-wall, bold look? That’s simple, as well: play up the contrast. Find out what shade of wood you have, look opposite the color wheel, and bam, there’s the color of your walls. As an example, if your wood has a warm color like orange or gold, paint the walls a cool blue or gray. Both surfaces end up popping when you go with such a paint scheme, so don’t be afraid to experiment! What colors do you like on your walls? We talk a lot about the various points in your house that are covered with flooring: the kitchen, living room, bedroom, bathroom, and so on. Have you ever thought about the flooring options that are available for your stairs, however? It isn’t something that is often covered, so without further ado, here are some suggestions for your staircases regarding safety and design. First of all, let’s talk about that safety aspect. No one likes to think too hard about it, but the cold hard facts show that falls on stairs are one of the leading reasons that Americans have to visit emergency rooms. That is why it is critically important to consider the overall safety of any flooring option you decide to go with, especially if you have children or elderly people living in the home that may have to go up and down stairs. 1) Hardwood flooring. Everybody loves the idea of hardwood: it’s elegant and lends a fine aesthetic to any household. It can be installed in any variety of patterns and colors, further modified by stains. It is easy to clean and hard to mess up, ensuring that it will last for a long time with a minimum of upkeep. On the con side of things, it is often slippery, especially when one is wearing socks. 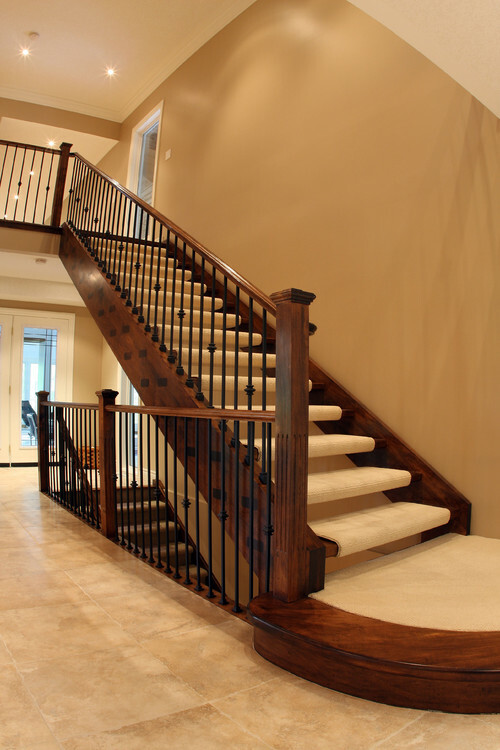 It is important to make sure that your stairs are not too tall when considering hardwood. For added safety, think about installing safety strips every couple of steps. 2) Carpeting. This is especially great if you can get it to match whatever carpet you have on the adjoining levels and adjacent rooms. It does require a bit more maintenance and cleaning than a floor such as hardwood, but it has the benefits of being quiet underfoot, feeling nice on the soles of your feet, and serving as a cushion in the event of a spill down the steps. Another note: you can combine carpeting over hard wood if your bottom or top floors do involve wood; a strip of wood on either side of carpeting will make sure that your stairs don’t look out of place! For more information regarding other types of flooring such as tile, laminate, or cork, give us a call! The last time we talked about flooring, we dug all the way back through human history to the days when a floor was little more than a simple patch of dirt. Over time, humans developed the technology and know-how to turn these dirt surfaces into something more, going from primitive straw-and-cow-dung cement to wood planks to heated stone floors within a few millennia. Carpets and rugs began to pop up around the known world in Asia and the Middle East, eventually being brought back to Europe and beyond. But where did we go from there? Interestingly, a lot of the flooring options other than stone and hard wood came to us largely by accident. You likely either have or know someone who has linoleum flooring in their kitchen. This material was developed in England by a man named Frederick Walton in the mid-1800s. At the time, rubber floors had fallen out of favor and had been so for two centuries. Walton was a rubber manufacturer and noticed that linseed oil formed a flexible skin when it solidified, not unlike rubber. Once he perfected the process of manufacturing sheets of this skin, we had our first linoleum flooring. Along with Walton’s linoleum, materials such as cork and asphalt became popular in tiled floors in the late 1800s and continued to be so until the early 20th century. It was at this time that an American inventor named Waldo Semon accidentally created what we now call PVC, or vinyl. He was attempting to bond metal with rubber in the year 1926 and in the process, invented PVC. At first, his material was used in shock absorbers, synthetic tires, and wire insulation. After the end of World War II, however, it became a popular flooring material that you can still buy and install to this day. The truly remarkable thing about floors these days is that nobody is limited to a single type of floor, and indeed, I’m willing to bet that you have multiple materials in your own home. What kind(s) of flooring materials are you interested in or do you already own? If you have a computer, possess an internet connection, and are reading this article right now, chances are very high that you have some type of flooring that isn’t just a bunch of dirt. You may have carpet, hardwood, tile, vinyl, linoleum, cork, or any combination of the above. It’s no surprise that we have an abundance of options that are available for use in our home flooring designs. However, this was not always the case. Where do floors even come from? Who had the idea to actually put floors down in their homes? In this article, we go way back to explore the foundations (pun intended) of flooring throughout world history. In early human civilization, a floor was usually just the dirt contained within the walls and ceilings of a residence. The most advanced humans got for a good long while was to strew hay, straw, and cow dung across the surface. This would get packed down after use, solidifying into a cement-like material. In early European, some peasants would actually spread mint across these dirt floors to make the room smell more pleasant. The ancient Egyptians are the first people we can pinpoint that used stone floors. It wasn’t long before they were using the stone not only as a practical flooring surface, but also an artistic medium. This is where we got such artwork as tiles and mosaics. Stone flooring continued into the modern day, with the Greeks using oblong stones and pebbles in their work and the Romans learning how to use stone floors to heat their living spaces by lighting fires under the rooms. During the middle ages, we saw the rise of wooden flooring. To begin with, the planks were rough and asymmetrical. Over time, the planks were sanded and smoothed. Varnishes and stains were created to add to the floors’ longevity. Carpets and rugs began to spring up across the globe, with rugs being developed by the Romans and perfected by the Persians (modern-day Iran). Carpets can be traced back to the Chinese Sung Dynasty throughout the 10th to 13th centuries. These wonders found their way back to Europe, due in no small part to explorers such as Marco Polo’s adventures eastward. Stay tuned for our next installment in the history of floors! Ideally, you have your hardwood floors refinished before you actually move into the home. The reasons are simple: number one, you can’t walk on the floors the entire time they’re being refinished, number two, you need to move all of the furniture out of the space before it gets done, and three, it usually costs less since you can conceivably do it all in one go. You can sand and refinish at any point during the year as long you keep the indoor temperature between 65 and 75 degrees. During the hot summer months, especially August, the drying process for the refinishing can take longer. This is largely due to the humidity that summer brings with it. Of course, if you can vacate the home for a week or two, then it shouldn’t make that much of a difference anyways. The biggest mistake that people make when scheduling their floor refinishings is not allowing enough time for it to be done. Refinishing an entire home can take anywhere from 7 to 9 days before you can put furniture back onto the floors. This process takes even longer if you have to have carpet removed or a lot of furniture taken out of the space. Because of the last reason, make sure you are planning well in advance when to get this whole process done. If you’re moving into a new home, plan on staying in your old home for an additional week or so. If necessary, you can also delay the moving of all of your furniture and crash in the basement until the project is complete. If you absolutely must be living in the home while scheduling a refinishing, no worries: just be aware that it will likely take more time and cost you a bit more inconvenience. Best of luck! Knowing how to properly care for a carpet is a great way to increase its lifespan. A properly cleaned and maintained carpet can easily last twice as long as one that is neglected and poorly maintained. You can find any number of carpet cleaning tips online, but here are some of the basic strategies that we recommend you use day-to-day. Vacuum carpet as least once a week, and even more if you have an area of heavy traffic. Vacuuming frequently prevents the buildup of particles that cut into your carpet fibers, prolonging the lifespan of your carpet. Once a month or so, take some time to use the specialty tools on your vacuum and get into the nooks, crannies, and corners of the spaces you’re vacuuming. Note: making a single pass over the area with the vacuum is rarely enough to get the job done. Yes, you’ll pick up the surface layer of grime and will see your bag start to fill up, but it will take a couple more passes before you get all the way down to the particles that have been worked down into your fibers. Take your time when vacuuming and don’t try to go too quickly. Make long, slow passes over the areas you are tackling, especially ones with high traffic. 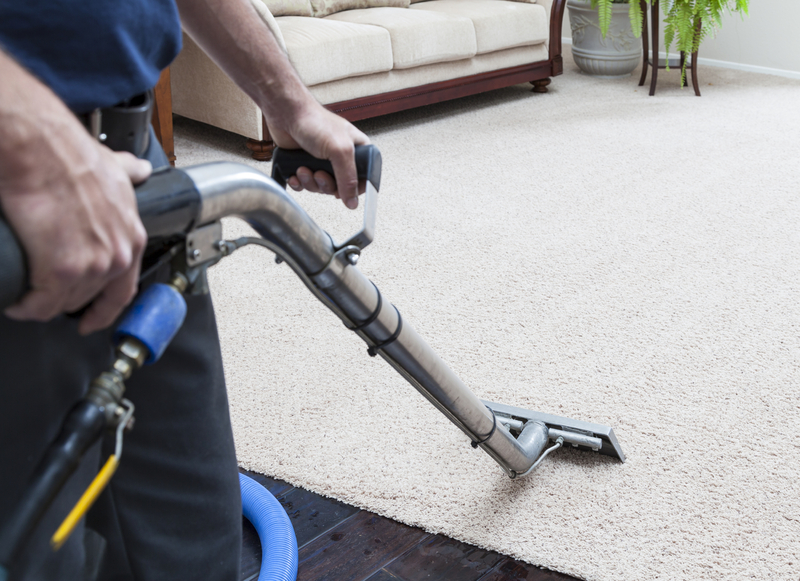 High-traffic areas should be vacuumed over a couple of times from different angles. Clean the carpet before you feel like you absolutely have to. It’s better to catch it with a little bit of debris at a time or it becomes more difficult and takes much more time. Before and after the steam cleaning, vacuum the whole area. If there are stains that you intend to clean up, make sure that you pretreat them before going in with the steam cleaner. Don’t over-wet the carpet, and once you are through, make sure you let it dry completely before putting it to use. Wet carpet can easily form mildew, so turn on any fans that you can, crank the AC, and use a dehumidifier if you have one. If you have installed hardwood flooring in your home, you are likely aware that it is a living, breathing type of floor that swells and shrinks according to changes in temperature. Keeping that in mind, here are a few tips that you can use to help maintain your floor during the cold winter season. Keep the level of moisture entering your home as minimal as possible. Everyone likes to go out and play in the snow, but your boots capture lots of moisture that can prove destructive to your hardwood. Make sure you clean your boots off outside if you can on a mat, and then on an indoor mat. Once you’ve finished drying them off, knock off all of the snow salt that has accumulated on them to prevent scratches on your floors. Keep a mop or rags beside your front door at all times, especially if you regularly leave the house throughout the day. If your front door is continually opened and closed, you increase the chances of snow entering the home and damaging the floor. If snow does get inside, don’t wait for it to melt: mop or soak it up as quickly as possible. 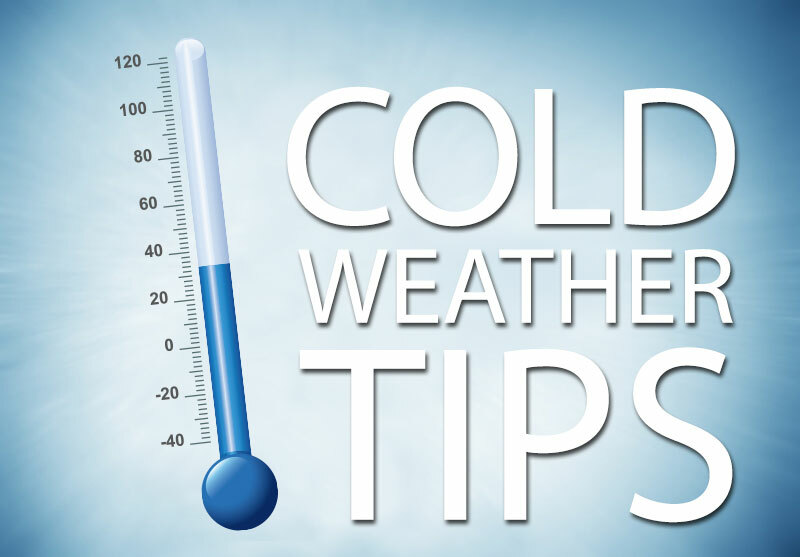 If you have a fireplace in your home, now is the time you’re probably thinking about using it: it will keep the house warm and comfortable during even the coldest weather. However, be careful that you aren’t using it excessively: keeping a wood fire burning without any humidity in the home will make the air very dry and potentially damaging to your hardwood floors. If you want to maintain atmospheric humidity, you can keep a water kettle boiling above the fire to help. Make sure that you know just how old your hardwood floor is. If it is getting up there in years, it may be time to add another layer of protection to it. Clean off the surface, sand it, and paint a coat of epoxy or polyurethane over the whole area. Don’t let the winter ruin your home’s beautiful hardwood; take action as soon as you can to prevent damage! Have you ever taken a look at your hardwood floors and wished that you could change their color? Or perhaps you’re looking into buying a house, but you want the hardwood to be darker or lighter than the current floor is? Good news: you may not have known, but when you refinish a hardwood floor, you can absolutely change the color of it! It doesn’t matter if you’re going light to dark, dark to light, or anywhere in between: if you can sand and refinish your floors, you can change the color of them. The process for sanding and refinishing is simpler than you might think. This first step is to purchase or rent a sanding machine and sand down the floor that you are refinishing. Do about three sandings, moving from coarse grit down to your finest grit for best results. This should give your hardwood a smooth surface that will readily accept any stain that you add. Your floor should look basically like brand-new hardwood once you’re done. With that step out of the way, now it’s time to choose your stain. There are many, many different options ranging all different colors, so try picking out a couple of choices and testing them on your own floors first. This is an essential step because every floor is different and may take different colors differently than another. You may be hesitant to stain over a large area if you’re just testing it out, but we can assure you that this will give you the best visuals and is well worth the time spent. The last step is to add two to three coats of polyurethane. This coating will take about 24 hours per layer to dry, assuming you’re using an oil base (water based polyurethane dries faster but isn’t as durable). Make sure that after every coat application, you buff the floors in order to smooth them out and help the polyurethane last longer. 90-95% of people select a satin finish for their hardwood, but don’t let that stop you from checking out some of the other choices: you can look at matte, gloss, and semi-gloss, as well!